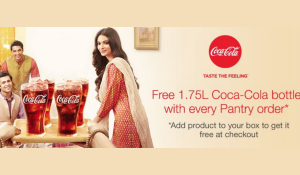 Amazon Pantry Offering 1.75L Coca-Cola Bottle Absolutely Free with every Pantry Order. -> Amazon Pantry available Only in Hyderabad & Bangalore. • That's it! Your Amazon Pantry order will be delivered at your doorstep.